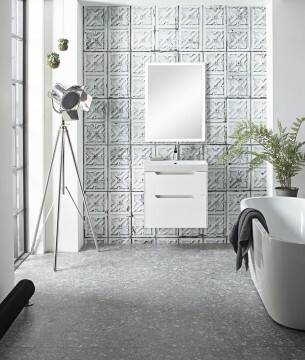 When it comes to giving your bathroom a modern makeover, think clean lines and simple styling. 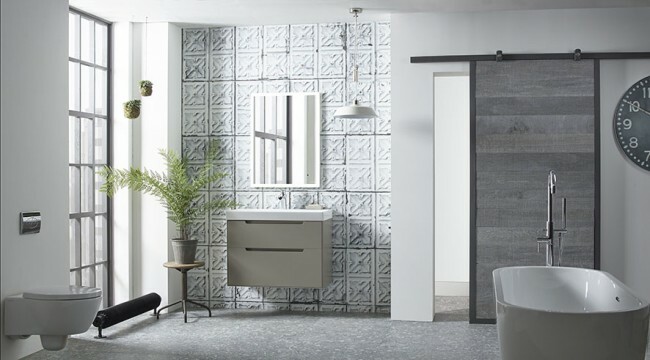 Read on for some inspiring ideas on how you can transform your bathroom into a chic and contemporary sanctuary. Furniture is a key part of any bathroom design. Having plenty of space to store all your bathroom essentials so that they are close at hand when you need them but neatly hidden from view will help to give your bathroom a sleek, streamlined and uncluttered feel. Basin units in contemporary, neutral colours in both matt and gloss finishes are perfect for a modern bathroom. With its cool and chic styling, our Monograph range comes in light clay and gloss white finishes. 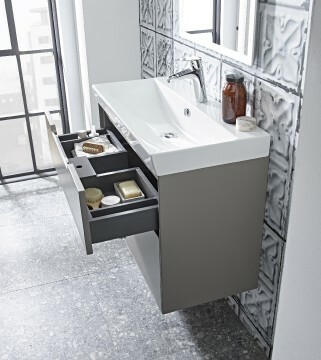 Available with or without an elegant leg set, basin units have two soft close drawers and create a functional and stylish look. Helping to keep everything neatly in place, Monograph units also come with useful drawer dividers, which can help you organise smaller bathroom products. Freestanding baths are the stars of many modern schemes and can create a real focal point in bathrooms of all sizes. Look for a model made from glossy, crisp white, lustrous acrylic, which will enhance your bath’s contemporary styling. Not only will your tub be beautifully smooth to the touch, but acrylic is also a very durable material with great thermal properties as it retains heat. Featuring gentle curves, which are designed for comfort, and a clean design, our Opus freestanding bath would look stunning in every bathroom! Or, if you want to go a bit bolder, our Stretto bateau freestanding bath has sweeping contoured lines and will make a real style statement! Both models are made from acrylic and are the perfect partners for our freestanding Lucca bath shower mixer, which will enhance the beautifully elegant, modern look of your space. 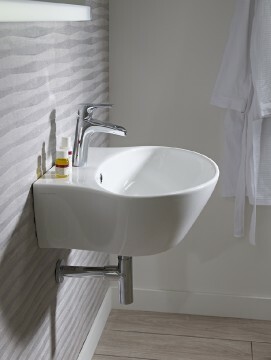 Wall hung sanitaryware and basin units can really help to give your bathroom a chic and contemporary look. They are also very well suited to smaller bathrooms as they free up valuable floor space, helping to make your room look and feel more spacious. Featuring organic shapes and crisp, modern styling, our Bayswater saintaryware range includes beautiful basins, which can be mounted on a simple chrome bottle trap or a standard or semi pedestal if you prefer. Coordinating perfectly with the basins, Bayswater WCs come in a choice of wall hung, back to wall or close coupled and each has fully enclosed sides that conceal all pipework to enhance their modern appeal. Don’t forget to make sure your brassware beautifully complements your sanitaryware to ensure you create a cohesive design. Waterfall effect taps and mixers are perfect for creating a luxurious, spa-style look in your bathroom. Tapping into this trend, our Lucca range will enhance the styling of your Bayswater basin or Monograph basin unit. Featuring a stunning open-spout design, the basin mixer is finished in cool chrome and comes in a standard or tall version. A stylish mirror will add the perfect finishing touch to your bathroom and can tie your contemporary bathroom scheme together beautifully. Not only does our Illuminated slim mirror look stunning with its sleek, slimline design, but it also benefits from LED lights and a handy, heated demister pad, which keeps the glass nice and clear. A touch-free infrared on/off sensor operates both. 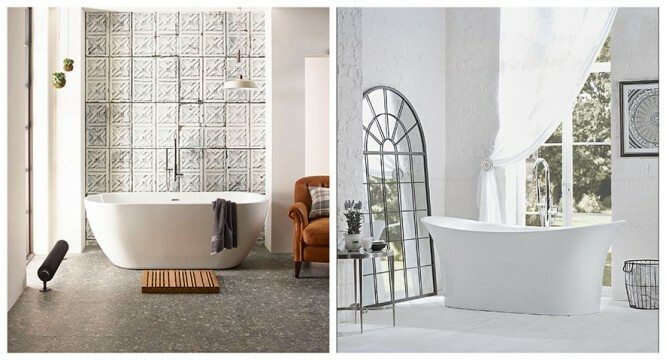 Visit our website, Instagram, Facebook and Twitter pages for more bathroom inspiration and click here to find your nearest Laura Ashley Bathroom Collection retailer, who can help you create your dream bathroom.